John Platt was born in 1886 in Leek, Staffordshire, the son of local hoteliers. Educated at the High School, Newcastle, he trained at Margate Art School, at the Leek School of Art and as a scholar under Robert Austin at the Royal College of Art (1905-1910). He took up his first teaching post at the Leek School of Art from 1910-1919 and married his wife Phyllis in 1911. Developing an early specialism in oils, watercolours, engraved woodblocks and coloured woodcuts – the latter derived from his deep interest in Japanese printmaking - he held his first exhibition at the Royal Academy in 1913. Fascinated by painting seaside subjects in the open air and by the woodcut medium, he completed interior design, stained glass, tapestry and mural projects for All Saints Church in Leek during 1913-1916. He also exhibited at the International Society of Sculptors (1917) and for the Arts and Crafts Society. He was commissioned towards the end of the Great War (1914-1918) and served in the Royal Army Service Corps (Transport). After the war, he exhibited woodcuts for the New English Art Club (NEAC) and for the British Council and was awarded a Gold Medal at the International Print Makers’ Exhibition in 1922. He designed several posters for London Underground, including For the Zoo (1922) and produced coastal views such as The Port of San Tropez. His academic career also flourished. He taught at Harrogate School of Art (1919-1920), at Derby School of Art (1920), at the Edinburgh College of Art (1920-1923), as Principal of the Leicester School of Art (1923-1929) and at Blackheath School of Art, London (1929-1939). During the 1930s, from his studio on the roof of Blackheath School of Art, he maintained a steady output of highly-regarded woodcuts, prints and seaside paintings as well as a full teaching schedule. His publications included articles in the journals The Artist (1934), The Studio and the book Colour Woodcuts; a Book of Reproductions and a Handbook of Method (1938). In 1938, Platt became President of the Society of Graver-Painters in Colour, a post he held until 1953. With the outbreak of war in September 1939, Platt became an official war artist - authorised by the War Artists' Advisory Committee under the direction of Kenneth Clark - for the Ministry of War Transport. He moved to new studios in Putney in 1942 and received government commissions to depict railways, docks, naval convoys, coastal manoeuvres and military traffic on the River Thames. 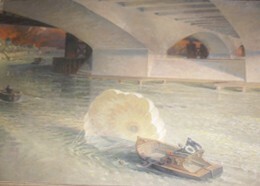 His oil paintings as a war artist - heavily annotated with information on light and weather conditions - included River Police Incident in the Battle of Britain, under Blackfriars Bridge (1943), Sunset with Part of the Fleet Coming into Shore Circa 1942, RAF Air Sea Rescue Launch, London Bridge Circa 1942, A British Naval Convoy at St Anthony’s Lighthouse, Falmouth Circa 1942 and Wartime Traffic on the River Thames: River Mine Sweepers, Night Scene (1942). After the war, Platt tried to revive public interest in the woodcut medium, holding a major exhibition - ‘Fifty Years of the Colour Print’ - in Kensington in 1947. After his wife died in 1949 and in failing health, he moved to Eastbourne, producing few new works between 1950 and his death in 1967. This page was added by Camilla Bergman on 25/10/2010.